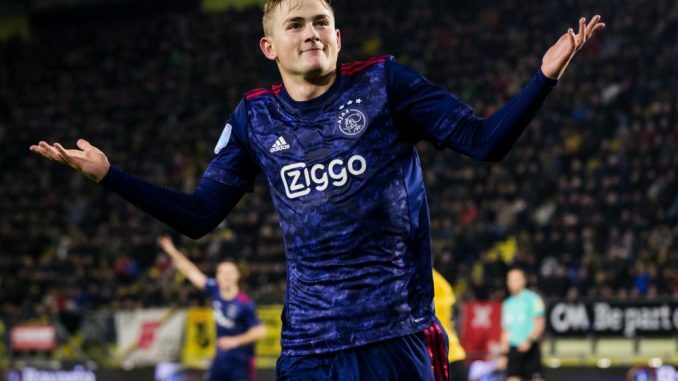 Ajax defender Matthijs De Ligt’s decision join forces with representative Mino Raiola could scupper a dream transfer to the EPL, according to reports. Europe’s heavyweights are chasing the 19-year-old star regarded as one of the best talents on the continent. Liverpool, Manchester United, Manchester City, Arsenal, Chelsea and Tottenham Hotspur are all monitoring his progress. Paris Saint-Germain and Juventus are the only two sides to register any official interest in the impressive centre-back, valued at £50 million by his club. But, the Daily Mirror reckons there is a feeling in the Netherlands the English sides are unwilling to step up their reported interest as they are not interested in getting involved with Mino. Spanish manager Pep Guardiola fell out with Raiola after forcing Sweden international Zlatan Ibrahimovic to quit La Liga giants Barcelona back in 2011. And, when the super agent branded now-Manchester City manager Guardiola “a coward and a dog” the previous year, the Catalan hit back revealing Mino made official contact asking if they wanting to sign Pogba from arch-rivals Manchester United. And after taking Paul, Ibrahimovic and Henrikh Mkhitaryan to Old Trafford, the Red Devils’ top brass are not interested in working with him after they found out Mino was hawking the Frenchman around after the star fell out with Jose Mourinho. And with all the interest from Premier League, Ajax were hoping to give rise to a summer bidding war for Dutch international. Sides will get another opportunity to run the rule over Matthijs when Ajax face Real Madrid in the Champions League last 16.